It’s the perfect “local kid makes good” story. Actually, to be more precise, it’s a local kid making it to the “BIGS,” as in earning a spot on a Major League Baseball (MLB) roster. Nick Margevicius, who starred scholastically at St. Ignatius High School before taking his talents to Rider University compiling several collegiate honors, has reached the top of the mountain regarding professional ball. Margevicius, taken by San Diego in the 7th round (198th pick overall) in the 2017 MLB Draft, will charge onto the field and take the mound Saturday night making his first start against the San Francisco Giants from Petco Park, home of the Padres. Margevicius’ college coach, Barry Davis, once said he was very proud of Nick and all that he’s accomplished. He made a commitment to become the best pitcher he could be and advance to higher levels. That dedication Davis spoke of now affords this young left-handed pitcher to get the chance every little leaguer dreams of when playing catch with dad in the backyard, or looking to be selected by the neighborhood kids for a playground game. And speaking of proud, and having a catch with dad, Margevicius’ father, Mark, was absolutely beaming when NEO Sports Insiders reached out to him for his thoughts. “Yeah, this is really surreal,” Mark said over the phone, as he was sitting on a plane with family all making their way to California to witness such a momentous event. “I couldn’t be more proud of Nick. He worked so hard, and this was his goal. The baseball journey took him to many places, and now he’s arrived, and will be a starting pitcher in the majors. Nick’s work caught the eye of the Padres organization and coaching staff with one particular spring training outing against the Chicago Cubs. Imagine what this young kid was thinking as he looked across the way on the baseball field only to see Jon Lester warming up in the bullpen, and realizing he’ll be matching pitches with one of the game’s craftier southpaws, an all-star, and a postseason champion. Naturally, some nervousness began to settle with the new San Diego pitcher but at the end of the day, Nick realized that all he needed to do was just go out and pitch his game. Obviously, such a chosen course of action made enough of an impression to be considered for the Padres 25-man roster. The bottom line is that once Nick got the invitation to spring training with the big club, he seized the opportunity to throw well each time he toed the rubber. Mark believes that his son was also able to take full advantage of being in training camp for the full six weeks. It gave him the chance to be around some of the San Diego veterans the likes of Manny Machado, Ian Kinsler, and Eric Hosmer. And speaking of the minor leagues, Nick is making the incredible jump to the big leagues from San Diego’s Class A level squads. In the minors last year pitching for the Fort Wayne Tincaps, he actually came back home to throw against the Indians’ Class A squad in the Lake County Captains where he didn’t allow a hit until the sixth inning, while finishing his stint of 5.2 innings pitched with nine strikeouts. Fort Wayne has a very impressive list of baseball alums, including Tribe ace Corey Kluber. Nick, 22, has never pitched above Class A (High-A) ball, while this spring in the San Diego camp, he made four starts striking out 12 batters. He is scheduled to be matched up against the Giants’ Dereck Rodriguez. 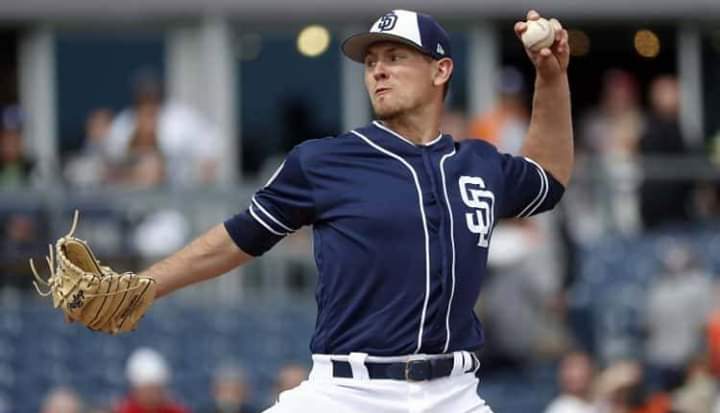 And while expectations will undoubtedly not be too high for the Padres newest member of the pitching staff, who grew up playing baseball with a very athletic family, whatever positives he can bring to the mound will only be a bonus. After all, his making the big league squad was probably a surprise to many people; who is to say young Nick won’t continue throwing more surprises at MLB batters? Nick Margevicius once said he dreamed of being a big league baseball pitcher since he was 3-years old. Saturday night, 19 years later, that dream will come full circle. It’s a constant reminder of that often used adage suggesting hard work pays off for those willing to sacrifice and put the work in. And when the local kid from Cleveland stares towards home plate facing the Giants’ leadoff hitter in the top of the first inning 24 hours or so from now, he will sense that pride knowing such hard work led him to this special time and place; and realizing how much more sweeter the moment will be because he got there the right way.